Nimona is actually my twelve-year-old daughter’s book. I knew it was good when she didn’t even want to put it down long enough for us to check out at the book store. When she finished it the next day, I knew I had to read it myself. I’m so, so glad I did. 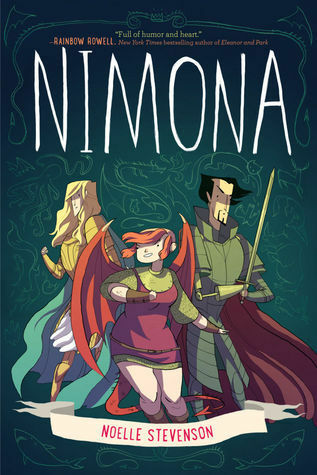 So, apparently Nimona started life as a web comic, but to read the whole thing now you have to buy the book. It’s totally worth it. You should go buy it right now. Maybe even buy two copies, because this is a book that I could easily see reading over and over again. Also the sort of book that your friends aren’t going to return after you force them to borrow it, so it won’t hurt to have an extra copy laying around. The art is simple, especially at the beginning, which again betrays Nimona‘s internet origins, but I found it enjoyable to see the work evolve over the course of the story. Noelle Stevenson’s style is fluid and impressionistic. Every panel looks as if it’s in motion, which adds a sense of realism that is reflective of the naturalistic portrayal of the characters and their relationships. At the same time, Stevenson avoids realistic or consistent color schemes in favor of constantly changing palettes that tell a story of their own and convey moods extremely effectively. I especially liked the oranges in the middle of the book and the acid greens near the end. Nimona herself is a great character. Though at times she skirts a little too close to Manic Pixie levels of quirkiness, she doesn’t exist in service to anyone’s story but her own. I love the growth of her friendship with Lord Blackheart, and it’s nice to see a bit of gender role reversal here, with Nimona as the rash, bloodthirsty one and Blackheart as a temporizing force and voice of reason. Blackheart and Sir Goldenloin are both nicely written, with a good backstory, and the ending of their story feels organic and earned. I also really appreciate that the only other two significant characters, The Director and Dr. Blitzmeyer, are women, another smart authorial choice that avoids the fantasy convention of marooning female characters in a sea of testosterone. While Nimona doesn’t get much interaction with these women, just their existence avoids one of the biggest problems I tend to have with fantasy stories in general. The thing about Nimona is that it’s utterly charming. It’s funny and smart and sweet and deploys its pathos in exactly the right ways at exactly the right times to tug at the reader’s heartstrings. Like many web comics, it does tend to meander now and then, but the story is overall well-conceived and deftly executed with a minimum of sidetracking so that it’s cohesive when published in a single volume. Nimona is a great book and a fast read, and it might (probably) will make you cry. Highly recommend.